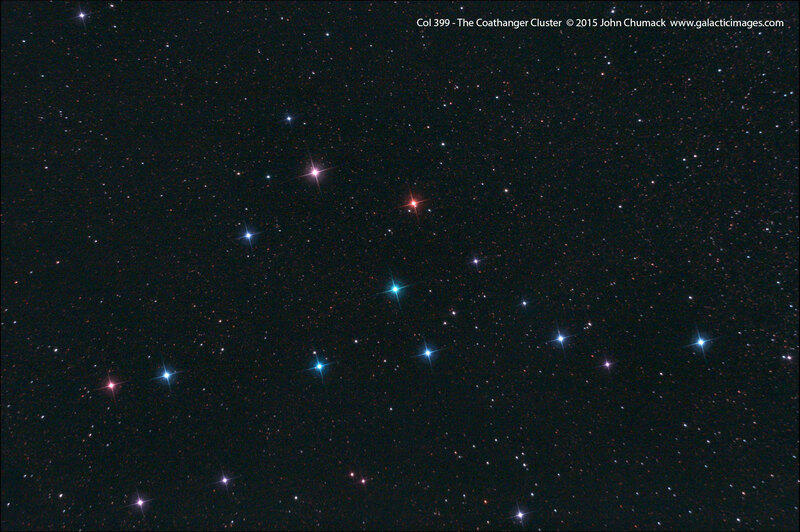 Explanation: Is this coat hanger a star cluster or an asterism? This cosmic hang-up has been debated over much of last century, as astronomers wondered whether this binocular-visible object is really a physically associated open cluster or a chance projection. Chance star projections are known as asterisms, an example of which is the popular Big Dipper. Recent precise measurements from different vantage points in the Earth's orbit around the Sun have uncovered discrepant angular shifts indicating that the Coat Hanger is better described as an asterism. Known more formally as Collinder 399, this bright stellar grouping is wider than the full moon and lies in the constellation of the Fox (Vulpecula).